It’s no surprise that the Richmond International Airport (RIC) plays a vital role in the Central Virginia regional economy. According to the 2008 Chmura Economic Analytics Economic Impact Study, RIC and its tenants contribute more than $800 million to the local economy. 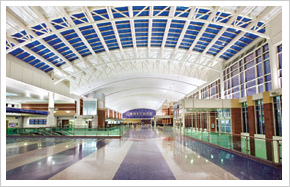 The Eastern Henrico airport is shiny, bright and new, only minutes off of Interstate 64, and it couldn’t be more strategically positioned to support Henrico County businesses. "The airport is located in a sweet spot," says Troy Bell, Director, Marketing & Air Service Development/PIO, Richmond International Airport. "This airport is very good if you frequently fly domestically, as we are strategically located on the Eastern Seaboard. We are close to D.C. to the north and the Raleigh/Durham area to the south. For international travel, the airport is well-connected to major U.S gateways, offering single-connect service to major destinations around the globe." If you haven’t visited the airport in the last few years, you should. The recent $300 million dollar renovation has transformed the outdated space into a sleek modern airport with a great new layout, complete with additional gates and ticketing counters. It manages to balance the sophistication of a large airport with the charm and convenience of a smaller one. It’s intuitive. And it’s complete for now. "RIC’s heavy construction projects are done for the foreseeable future," says Bell. But that doesn’t mean there isn’t a plan for growth. On the contrary. RIC’s recently updated Master Plan is reset and primed with economic trigger points to alert airport officials when the current design is ready for an assessment. "We have a road map for the next 20 years. It’s a demand-based plan to accommodate things like substantial increases in passenger traffic, cargo volume or aircraft activity. We certainly have the capacity for future development and growth. In fact, RIC has developable acreage on the property where the Virginia Air National Guard was previously located."